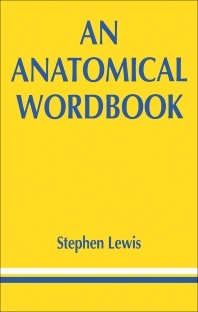 An Anatomical Wordbook serves as a reference guide of words used in the science of Anatomy. The text aims to enhance the comprehension of all who study anatomy by providing explanations to anatomical words. The book is organized in such a way that the words are grouped together by common themes for easy cross-referencing. The groups of words found in the text include bone names, names applied to muscles, words pertaining to joint types, and anatomical words where Latin and Greek are often used. Abbreviations, common prefixes and suffixes, anatomical lines, planes and points, regions of the abdomen and head and body types are likewise presented. Anatomists, physicians, and students and workers in the field of medicine will find great use of this book.